Lucy has grown up in a remote Victorian mansion with her father, aunt Penelope, and cousin Margaret. Lucy and Margaret are homeschooled, and the estate is a frequent meeting place for the country club their family is involved with. Lucy's mother died when she was still a little kid, so she has grown up with Penelope as a mother figure. But as the novel opens, Penelope wanders into the woods and disappears and Lucy learns there is a lot about her aunt - and the house where she has grown up - that she doesn't know. All of the relationships in this book are complicated and uncertain and filled with secrets. It made me feel like I didn't know who to trust, or who Lucy should trust. In true horror novel fashion, things are far weirder and scarier than they appear and not everyone is going to get out of here alive. I loved the setting and the atmosphere of this novel. Old, isolated Victorian mansion with dark secrets? Yes, please! Although the story is contemporary, Lukavics gives it a timeless quality that added to the overall dark creepy feeling. There is no mention of computers or cell phones until quite late in the story and even those references were minimal. Earlier mention of Lucy doing research must have meant that she was using the internet, but Lukavics carefully didn't say that. We all have different things that scare us and I think her last book, Daughters Unto Devils, pushed more of my particular horror-buttons. 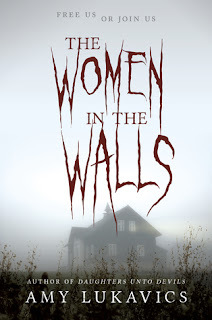 Still, this worked quite well as a horror novel and I was surprised a few times when I really thought about the fact that it is written for teens. There is a part late in the book that is shockingly, horrifically gross. Just before it there was something that hinted at what was coming but I thought "Oh no, she won't go there." But she went there! I don't even know if I liked or disliked certain parts of this novel, but they were certainly effective at conveying horror. Wow. This is a very quick-to-read, well-crafted, true horror novel - which you don't see nearly enough in teen fiction. I think Daughters Unto Devils is still my favorite (I gave it 5 stars and it was my favorite book I read last year) but this was a great follow-up!